Live Chat Business Created by jakweb. This templates have specific characteristics, namely: Live has features such as High Resolution: Yes, Compatible Browsers: IE8, IE9, IE10, IE11, Firefox, Safari, Opera, Chrome, Edge, Software Version: PHP 7.x, PHP 5.x, PHP 5.3, PHP 5.4, PHP 5.5, PHP 5.6, MySQL 5.x . 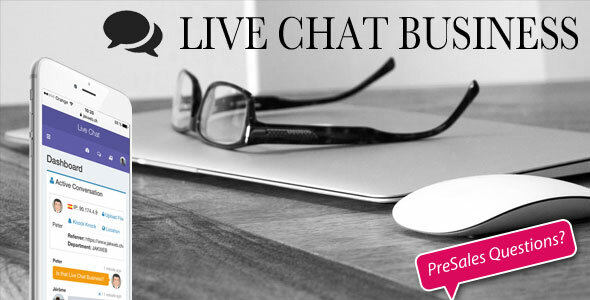 You can use this Live Chat Business on Php scripts category for bootstrap, browser, departments, help, html, joomla, live-chat, live-support, mobile, operator, proactive, sms, wordpress and another uses. Never miss a customer again, deliver first class support, operator conferences, operators private chat and all that without special modifications on your web server or mobile phone. We have build Twilio/Nexmo into Live Chat Business which can send you a text message each time a customer or a client needs your help. Features like, ProActive, GEO – IP, World Map with Client location, file sharing, avatar, mobile optimised, operator private chat, operator public chat, unlimited operators, cross browser, unlimited departments, slide up, pop up, live status, desktop notification, email notification, sms notification and much more. That is the most advanced but easist live chat / support you ever seen and used. It works on all websites included WordPress, Joomla, PrestaShop and all others. One installation will serve all your websites. Login with any operator first and the chat will go online, it is best to use two browser for testing but not necessary. Our Software is PHP 7 ready! Do not use our main website for demos unless you have a real question.Thank you very much.